• Sociological research on participation in the arts; media use and consumption; the conditions under which makers of cultural products operate; the functioning of institutions that make, distribute and/or judge cultural products, arts and media policy; etc. • Psychological research on the cognitive processing of cultural products such as literary texts, films, theatrical performances, visual artworks; etc. • Media and communications research on the globalization of media production and consumption; the role and performance of journalism; the development of media and creative industries; the social uses of media; etc. • Economic research on the funding, costs and benefits of commercial and non-profit organizations in the fields of art and culture; choice behavior of audiences analysed from the viewpoint of the theory of lifestyles; the impact of economic institutions on the production or consumption of cultural goods; etc. The production and consumption of media, art and culture are highly complex and interrelated phenomena. Our insight into these broad domains will be considerably enhanced by studies focusing on the interrelationships of the many factors that shape behavior towards art, culture and the media. 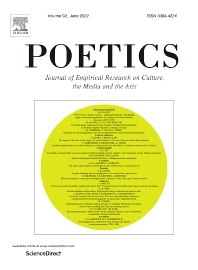 Poetics publishes not only advanced research reports but also overview articles. Occasional special issues, guest-edited by specialists, present the state of the art and/or discuss new developments in a particular field.